I’ve been thinking of posting a Korean food for a while. 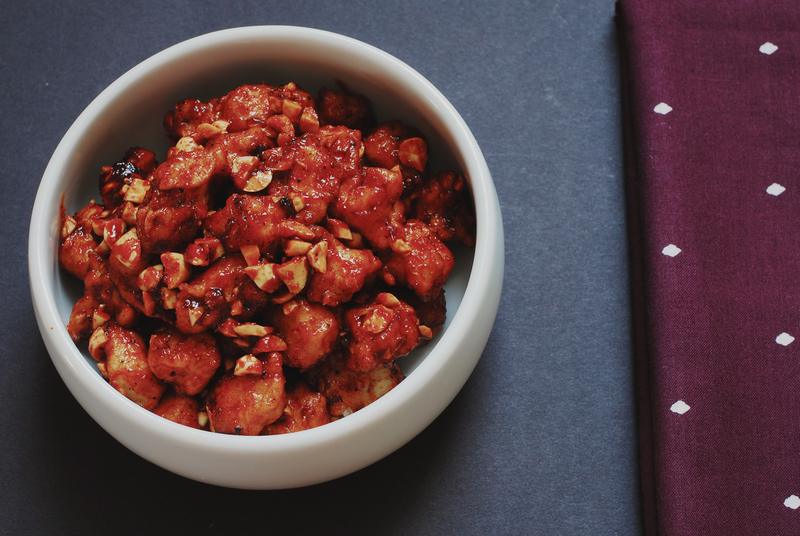 Finally, here is my first Korean recipe for this blog – Dak Kang Jung, a Korean style fried chicken covered with sweet and spicy sauce. Dak means chicken in Korean, and Kang-Jung originally means a type of traditional Korean snack – puffed rice candied with honey or corn syrup. 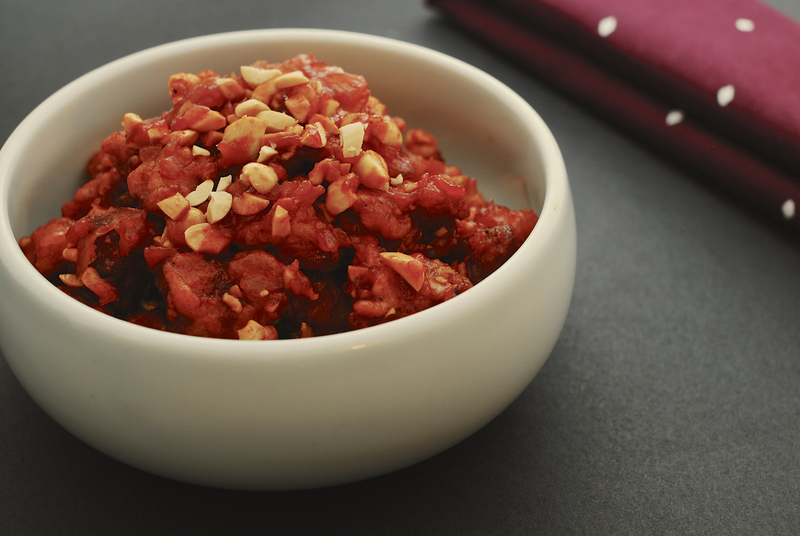 Dak Kang Jung uses boneless chicken meat and has the sweetness and crispiness of Kang-Jung. It doesn’t have to be spicy and you can actually see people making this without any spicy flavor, but spicy Dak Kang Jung seems to be more common. I should admit the weather today was probably too hot for making fried chicken. However, the process is pretty simple (even though the instructions seem longer than my average recipes) and most importantly, it’s just so addictive!! Cut chicken into approximately 0.5 inch cubes. Mix ¼ cup of flour and 1 tbs starch, add ¼ cup of iced water. Mix well and keep it in the refrigerator. Remove chicken from the milk after 1 hour. Add salt, pepper and 1 tbs garlic powder, marinate the meat in the refrigerator for about 15 minutes. Heat oil to 356 F (180 C), place the chicken back in the oil and fry for another 1-2 minutes until well browned. Place the sauce mixture in a pan. Heat the pan until the sauce bubbles and get thicker and richer. Place the fried chicken cubes into the pan and mix well the chicken and the sauce, add crushed peanuts at the end. Make sure the sauce is thick enough so the chicken can be coated nicely. 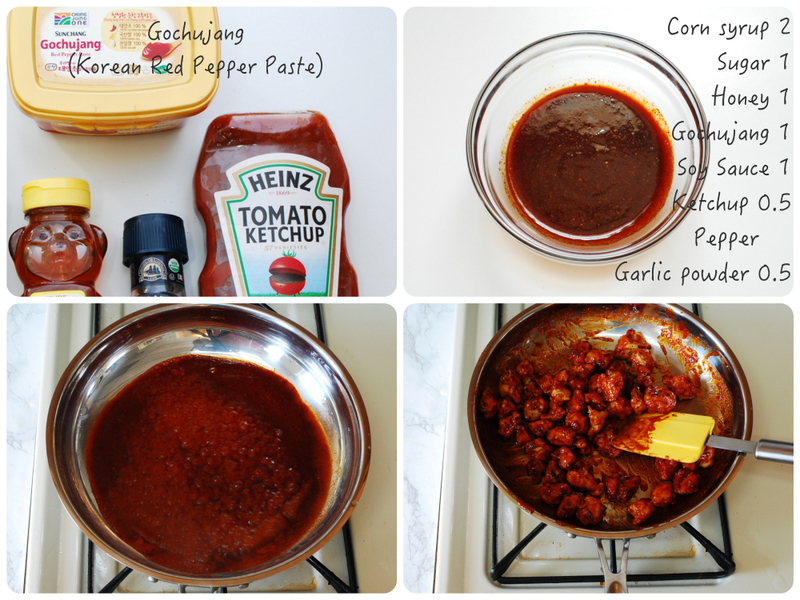 Looks great, thanks for sharing, lucky i have Korean paste in my fridge. Congrats for having the Korean paste and also for becoming the first commenter of the blog!